Countless times since the emergence of the Greek sovereign debt crisis, followed in quick succession by the debt crises of other unfortunate members of the PIIGS fraternity on the periphery of the Eurozone, the European politicians have boasted that they have come up with a solution and have licked the problem. Not so long ago, French president Nicolas Sarkozy boasted about how the bond vigilantes should never bet against the euro. And yet, after having “solved” the Greek debt disaster, these same bumbling politicians are soon back in the limelight, again promising that this time they have cobbled up a solution that will really work. We are now at it again. As Greece stands on the verge of default on her public debt, the Eurozone politicos and the IMF technocrats are supposedly in deep conversation about a really big solution to the Greek debt crisis which will really work this time. Based not on hard fact, but simply on rumors and a heavy dose of hope and prayer, stock markets across the globe are again rallying. As the markets soar, it is clear that this exuberance is based solely on metaphysics, and not on even a shred of hard, objective analysis. Even the rumors point in that direction, as the suggestion that the Eurozone, which is fundamentally insolvent, can borrow the equivalent of two trillion euros, nearly four times the size of America’s TARP of 2008, to bail out the banks that will be hurt by a 50 percent write-off of Greek public debts, is both sublime and ridiculous. The Greek debt crisis is also Greek tragedy, with a heavy complement of comedy added, courtesy of Europe’s inept political leaders. In an Op-Ed piece in The New York Times, Paul Volcker, chairman of the Federal Reserve during 1979- 1987, issued an eloquent warning against economic policymakers deliberately increasing the inflation rate as a way of dealing with escalating economic and fiscal problems that have defied all other policy measures. Volcker’s Op-Ed, entitled, “A Little Inflation Can Be a Dangerous Thing,” warrants serious reading by all concerned with the global economic crisis. Paul Volcker knows what he is talking about; it was he as Fed Chairman during the Reagan administration who squeezed high inflation out of the U.S. economy through a draconian process of high interest rates. “There is great and understandable disappointment about high unemployment and the absence of a robust economy, and even concern about the possibility of a renewed downturn. There is also a sense of desperation that both monetary and fiscal policy have almost exhausted their potential, given the size of the fiscal deficits and the already extremely low level of interest rates. In particular, due to the global sovereign debt crisis, economists and policymakers are discussing behind closed doors the desirability of a 5-6 percent annual inflation rate as a way of reducing the burden of national debts in advanced economies. As if the experience of Weimar Germany and Zimbabwe wasn’t enough to show the irrationality of such an approach, Paul Volcker again reminds us of the futility of engineering deliberate inflation as a policy “cure” for our economic woes. One can only hope that the former Fed Chairman’s clear warning is heeded. In a move that is no longer a surprise, one of the leading credit rating agencies, Moody’s, did the downgrade routine. This time it was two leading French Banks; Societe Generale and Credit Agricole. The cause was their significant exposure to sovereign debt from crisis-ravaged and virtually insolvent Greece. Moody’s made clear that these two French banks may be due for future ratings downgrading. The Eurozone politicians, especially in France and Germany, are in a panic over Greece and its insoluble debt crisis. They are currently doing what they have done repeatedly since the crisis erupted; reassuring the markets that the brilliant, highly competent politicians in Europe have the situation under control, and Greece will not default. At this point, no one with an iota of common sense believes them. Furthermore, the markets are increasingly aware of-and frightened by- the near certainty of a Greek debt default, perhaps followed by Portugal, Ireland, and in a worst case scenario, Spain and Italy. What this means is that the major banks in Europe, in particular France and Germany, are sitting on a mountain of worthless assets. This crisis is far from over, and the ratings agencies are far from done with the downgrading. What savvy observers have long predicted, a default by Greece on her massive public debt, has until recently been refuted by Eurozone politicians as even a possibility. These policymakers have already gone through two massive bailouts, funded by European taxpayers, involving more than 200 billion euros, to keep Greece from tottering over the edge. However, the marketplace, and even below the radar some European politicians, especially in Germany, have now been conceding what is so obvious to almost every other knowledgeable observer. Athens will default on her debt. With an imploding economy, in which ironically the austerity measures imposed on Greece as the price of the bailouts have worsened her public debt to GDP ratio, and no possibility of inflating her way out of default by currency devaluation (the trap of being in a common currency-the euro), mathematical certitude cannot be overcome. Greece is in an unsustainable sovereign debt trajectory. Two year Greek government bond yields have soared above the 50 percent range. Such yields only exist in a universe where the marketplace prices in the certainty of a sovereign debt default. And this is only the beginning. There is not only Portugal and Ireland next in line; there is also Italy and Spain. Then there are the French and German banks, highly exposed to a Greek sovereign debt default. In other words, Lehman Brothers on steroids. 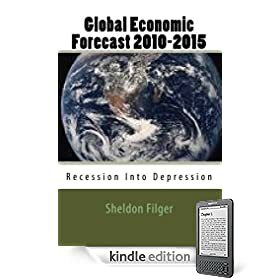 The doomsday debt crisis scenario I predicted in my book (Global Economic Forecast 2010-2015: Recession Into Depression) is being increasingly vindicated by a fiscal architecture that is unraveling with surreal velocity. Not much talk anymore about green shoots from U.S. Federal Reserve chairman Ben Bernanke. Despite infinite and very creative attempts by politicians in the U.S., the U.K. and the Eurozone to twist and spin economic statistics to make it appear that the world is indeed recovering from the global economic crisis, the data that is emerging is so bad it can no longer be “massaged.” The latest jobs report from the United States showed that in the month of August, zero jobs were created by the economy. The official news was bad by itself, but it hides an even worse reality. Even with no net new jobs created, the official discounted unemployment rate in America remained at 9.1percent. With approximately 200,000 new adults entering the work force each month, the only way that could have happened with no change in the U3 unemployment rate is if 200,000 discouraged job seekers left the labor market, or were merely eliminated form the ranks of the unemployed by the slick action of a statistician’s pencil. While America’s jobs crisis worsens, Europe has its own woes to contend with. The sovereign debt crisis is clearly getting more dangerous, with both Spain and Italy increasingly vulnerable to the bond vigilantes. And the U.K. is experiencing sluggish or non-existent economic growth, in the process undermining the objectives of its austerity program. The global economic and fiscal situation is so bad, even the IMF is starting to hit the panic button. I think the happy talk from politicians may just about have run out of steam.